This book is an interesting study of splits within the republican movement since the beginning of The Troubles. Its strongest points are its use of interviews and its description of the recent developments in breakaway groups, while its predictions about the future should be noted, writes Fergus O’ Farrell. The Origins and Rise of Dissident Irish Republicanism. John F. Morrison. Bloomsbury. 2014. As we approach the 100th anniversary of the 1916 Easter Rising, it is timely that the subject of dissident Irish republicans should be analysed. Established political parties, relative associations and former physical force revolutionaries are all attempting to promote themselves as the true custodians and heirs of the legacy of 1916. Dissident republican groups – who possess no mandate and are prepared to use violence against the wishes of the vast majority of the people – will no doubt also attempt to draw parallels between their own organisations and the Easter rebels of 100 years ago. Ominously, the author of this new study predicts that dissidents will use the centenary as an opportunity to renew their violent campaign. 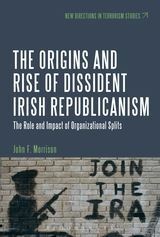 The Origins and Rise of Dissident Irish Republicanism examines the four main splits in republicanism since the advent of the troubles: 1969/70; 1974; 1986; and 1997. It analyses the internal dynamics of the republican movement, explaining the splits and the groups which emerged as a result. It is also ‘a parallel study of the evolution and politicization of modern day Irish Republicanism’ (p.35). Morrison, who is a lecturer in criminology, has constructed a model to explain these events. This model is clearly laid out in the second chapter. There are three types of split: even split; uneven split; and split avoidance. The origins of the next split can be found in the legacy of the previous split. The key stage of the model is step three, when the split becomes inevitable. It is also this stage which determines the outcome of the split in terms of the success and strength of the rival groups which emerge. This reviewer would argue that such an approach is somewhat flawed. The four splits are all different, occurring within different contexts, involving a variety of personalities and subject to a myriad of external forces impacting on the genesis, development, and outcome of the splits. While the model may be sufficient to explain one of the splits, the same framework cannot be employed to explain them all. Additionally, the historical narrative upon which the model is based is contestable. The model is supported throughout the book with interviews conducted by the author. The interviews are the strongest feature of the study, and often lend colour to the theoretical framework. Chapter three examines the 1969/70 split, when a faction led by Ruairí O’ Brdaigh broke away to form the Provisional IRA and Provisional Sinn Féin. Morrison correctly states that a major flaw of the Cathal Goulding leadership was its attempt to drop abstentionism from Westminster, Stormont, and Dáil Eireann, simultaneously. This move, he argues, was seen by some within the movement as ‘too much too soon’ (p.51). However, according to Morrison’s model, the split did not become inevitable until stage three, when violence on the streets of Northern Ireland broke out in the summer of 1969, and the IRA were seen to have failed in protecting embattled nationalist areas. This analysis diminishes the importance of abstentionism which was a core tenet to republicanism. Abstentionism was key, as by recognising the various parliaments, republicans would be acquiescing in the partition of Ireland. Republican purists considered the second Dáil of 1921 to be the last legitimate government of Ireland. Indeed, O’ Brádaigh and others considered abstentionism to be of such paramount importance that they broke away from the Provisionals in 1986 over the issue. While Goulding and his supporters did not succeed in dropping abstentionism until January 1971, it is arguable that once they began their move towards removing the ban on taking seats in the various parliaments, the split had become inevitable. Instead, Morrison argues that the split became inevitable when violence broke out and the IRA were perceived to have failed to protected Catholic areas. However, the historian Brian Hanley has challenged the contention that the IRA was inactive in the street clashes in Belfast and Derry at the time. Indeed, Goulding himself stated that the IRA had ‘been in action’ and ‘fully equipped units’ were involved. One IRA volunteer interviewed on the BBC remarked that ‘the people in the Divis Street area would have been massacred’ had it not been for the IRA. It seems that Morrison’s model is based on questionable historical assertions. Additionally, while this is a study of the internal dynamics of the IRA and its splits, not enough attention is given to outside forces. For example, the Goulding leadership’s lurch to the left (which was one of the factors contributing to the split) should be seen in the context of the Cold War. The final chapter is the best in the book. In it, Morrison gives an overview of the recent developments within the various break away groups. By assessing the attitudes and outlook of contemporary physical force republicans, the transformation of the Provisionals under the Adams/McGuinness leadership becomes stark. While some opponents of Provisional Sinn Féin/IRA were critical of the movement’s slow progress towards constitutional politics, this chapter makes clear that the gradualist approach was crucial in maintaining the coherence of the movement and in reducing the potential for violent splinter groups gaining support. The chapter also shows how gradualism, along with debate and canvasing of the grassroots of the organisation, the Provisionals were able to diminish the role of the army in favour of Sinn Féin. This is all well laid out and clearly explained. The great strength of this book is its interviews. According to the appendix, Morrison interviewed 42 republicans involved in The Troubles and he references them throughout the study. This provides a human quality to the theoretical model, as well as giving insights into the mood of the participants. For example, in an interview with one republican, we can see how splits were avoided through what is referred to as ‘internal methods’: ‘The next thing anyway myself and [Ruairí] O’ Brádaigh was called to a meeting in Sligo and we were threatened by [Martin] McGuinness and Pat Doherty and they had two henchmen outside the door, and told that we would be shot if another army was set up’ (p.144). This book is an interesting study of splits within the republican movement since the beginning of The Troubles. Its strongest points are its use of interviews and its description of the recent developments in breakaway groups, while its predictions about the future should be noted. However, attempting to explain the complex and disparate splits through the framework proposed here may be seen by some as spurious. Policy makers and academics should take notice of this study, but it would be best utilised to supplement a historical analysis of the various splits. Fergus O’ Farrell has a degree in history and politics from UCD. He is currently studying for a MA at the School of History and Archives, UCD. His thesis is focusing on Cathal Brugha. His interests include the political, social and religious history of 20th century Ireland. You can follow him on Twitter @fergus_farrell. Britons are applying for Irish citizenship to get an EU passport. Is this a problem?